Flights don’t have time to stop and wait for their passengers, and we know travelers don’t have time to stop and wait either. That’s why at Jiffy Airport Parking, we offer fast, free shuttles to each and every one of our customers. Our shuttles run 24 hours a day, 7 days a week, so you can catch one at any time. While some travelers prefer red-eye flights, others prefer flights that leave first thing in the morning; some even prefer flights that leave mid-afternoon. 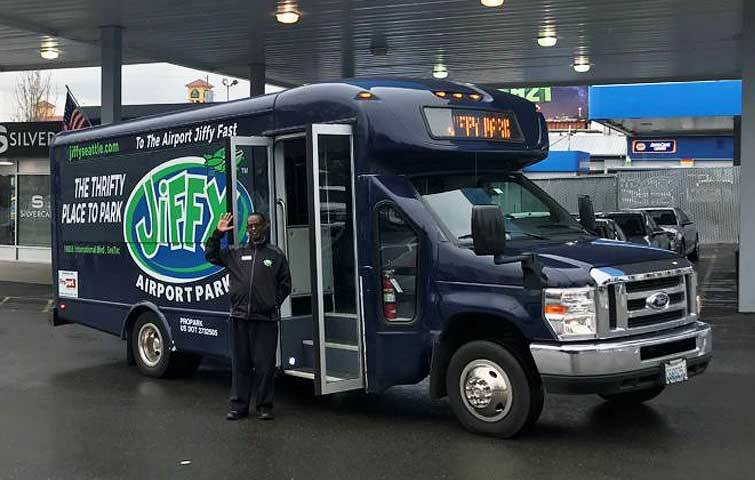 No matter what your flight time preference, you can count on Jiffy to get you to and from SeaTac quickly. Because our shuttles run all day, every day, you can hop on a shuttle at Jiffy and get from our SeaTac Airport parking location to SEA, or hop on one of our shuttles at SEA and get back to our SeaTac Airport parking location quickly. No matter when you plan your travel, we’ll be here for you. When you park at SEA, you’ll likely pay more than you want to for Seattle Airport parking. Instead, why not park with Jiffy? Our shuttles come free with every parking reservation. We’ll not only load your luggage into our shuttle, but we’ll also drive you comfortably to the airport and drop you off right at your terminal. We’ll also unload your luggage, so you’ll never have to worry about dragging it around. Don’t settle for the parking at SEA. Instead, make a reservation with Jiffy and enjoy our fast, free shuttle at your convenience. For the best shuttle service around, make your Seattle Airport parking reservation with Jiffy Airport Parking. We offer a variety of benefits that can make your SEA parking experience the best around.